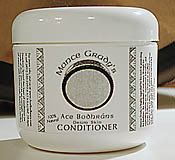 Mance Grady's Drum Skin Conditioner $10. Remember the ABC's of drum head conditioning - Ace Bodhráns Conditioner. Containing 4 oz. of 100% natural ingredients, ideal for nourishing your drum's skin to keep it pliable and to bring out the best in tonal quality. It's what Mance uses and recommends  otherwise he wouldn't put his name on it!